it for the purpose of increasing the sonorousness. There are several kinds of the vina in different districts ; but that represented in the illustration is regarded as the old�est. The performer shown is Jeewan Shah, a celebrated virtuoso on the vina, who lived about a hundred years ago. The Hindus di�vided their musical scale into several in�tervals smaller than our modern semi�tones. They adopted twenty-two intervals called sruti in the compass of an octave, which may therefore be compared to our chromatic intervals. As the frets of the vina are movable the performer can easily regulate them according to the scale, or mode, which he requires for his music. The harp, c/iang, has become almost obsolete. 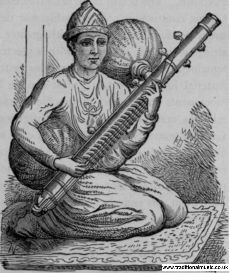 If some Hindu drawings of it can be relied upon, it had at an early time a triangular frame and was in construction as well as in shape and size almost identical with the Assyrian harp.